Preschool Salt Lake City - Family Recipes And Meal Planning | Child Time Inc.
As every parent knows, cooking for the family can be quite the challenge. When you already feel like there aren’t enough hours in the day, the thought of adding another item to your list of todos seems impossible. But as a parent, you also want your child to be eating healthy, and know that processed foods and things from drive-thrus aren’t the way to make that happen. 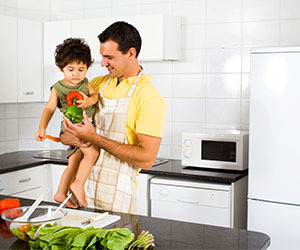 Child Time Inc. knows all about the struggle — not only do we care about the health and well-being of your child, but many of our teachers are also parents and look for easier ways to make cooking happen. Our preschool and daycare center has some cooking tips to make meal prep faster, easier, and even more delicious. Find some recipes that work for you, and contact Child Time Inc. to tour any one of our four locations! If you can knock out a lot of cooking on a day that’s not as busy, your entire week will feel less rushed. Not to mention, having a well-balanced diet and meals that are nutritionally dense will help you and your family feel better and stay healthier. You can use any of these recipes on their own, but we’re designing our food planning so that with one bigger day of cooking, you’ll be almost completely set throughout the week. This frees up a lot of time, allowing you to breathe easier. It’s a good idea to start with a protein base. Protein helps our muscles grow and strengthen, and it also keeps us feeling fuller for longer. If you choose one meat to focus on for the week, you can use it in many different meals, all while changing up the flavor. If you’re in a rush, a rotisserie chicken (or two) can go a long way, but it still requires some work (you’ll need to shred it for several recipes and carve it down). Otherwise, bake boneless, skinless breasts at 375℉ for about 20-30 min or until cooked through. Making a pot roast or using a slow cooker are both great ways to prepare pork or beef for the week. For either scenario, add onions and carrots for some added flavor — apple juice for pork is also a great way to help it stay nice and tender. Tofu, eggs, seitan, and lots of vegetables are also good alternatives for meat-derived protein. For each of these, you likely won’t need to do much additional preparation, since these protein sources don’t take as long to cook. Timing things correctly is what can take a 4-hour meal prep into one that’s only an hour. Always start with the things that take the longest to cook (meat, water boiling for pasta, things that require baking, etc. You can structure a whole week around protein serving as your base, and change up flavors/meals to keep things interesting. Once you have your protein picked out for the week, it can easily be adapted to each of these recipes. This means no more having the same leftovers for four days straight, and no more trying to get your kids to eat the same thing. With this meal planning solution, everyone wins. *As a note, alternative protein sources will work for nearly each of these recipes. Vegetables get a bad reputation, but when you can make them a staple in your child’s diet, you’ll be setting them up for nutritional success down the road. Plus, our preschool and daycare center teaches from a young age that veggies include essential vitamins and nutrients that help children grow — your cooking can reinforce these same ideas at home. Work to include at least one vegetable into every dish that you create. Certain veggies work best with certain flavors. Here are some guidelines to help you construct your meals in a nutritionally-balanced way each week. Sweet potatoes, zucchini squash, onions, corn, black and pinto beans, and peppers are all great options, and easy to cook in a pan. Spinach pairs wonderfully in both texture and flavor in pastas. Onions, tomatoes (try the sun-dried kind! ), mushrooms, and peppers are also excellent choices. Onions, broccoli, peas, peppers, water chestnuts, carrots (in certain recipes), peas, and zucchini squash can work wonderfully in Asian dishes. For Indian dishes, regular and sweet potatoes and tomatoes are good to use. A lot of American dishes do well with veggies that are added onto a meal, rather than cooked in the dish. Lettuce for sandwiches, beans and corn for chilis, and sides of baked zucchini or sweet potato fries will all enhance a meal. Encourage your child to try everything, and to try at least one bite of a new food or a vegetable, but don’t force it. Have them help you pick out fruits and veggies at the store to give them some ownership and choice, and keep trying! It sometimes takes kids 10 tries before they like a food. Once you’ve picked your protein, flavor, & vegetables, assembling everything is easy! You can either assemble everything in one day, or make one meal to last a few days. With certain proteins, it might be a good idea to freeze the remaining (cooked) meat, which will preserve it better by the time you’re ready to make the dish. The same principles can be applied for each of these meals. The meat can be the same, the veggies can be the same, the only thing that changes is the grain. Use tortilla chips for nachos, tortillas for tacos, and brown rice (or a mix with quinoa) for burrito bowls. Add cheese and salsa (if your kids like it) to either of these three, and you’ll be set! Enchiladas seem complicated, but they’re incredibly easy to make, and can use ground beef, shredded chicken, or shredded pork. Once you make your filling, you simply roll up each tortilla and place it in a baking dish — pour some salsa or some enchilada sauce at the bottom of the glass dish to prevent sticking. Cook up some brown rice, add your cooked veggies and meat, and let your child try a sauce that they enjoy for a perfect rice bowl. You can find lots of different sauces at the grocery store, all of which vary in sweetness and spice so that your young one can find one they enjoy. Orange sauce, peanut sauce, teriyaki — the sky’s the limit! This is very similar to a rice bowl, except uses noodles instead of rice. Both rice and egg noodles cook up fast, and your kids will love getting to slurp up some noodles for dinner. As one tip, it might be difficult for younger kids to use utensils to pick up noodles. Try cutting up their noodles into bites that are easier to grab with a spoon. Pasta is one of the easiest things to make, and you can often find pre-cooked meats that can easily be added to any meal (chicken sausages and meatballs, for example). Amp up your sauce by cooking some veggies down first, then letting them simmer in the sauce; however, spinach should be added last to a pasta dish since it wilts quickly. It is a little more time-consuming, but can make for tasty leftovers. Switch up from the regular pasta with ease by turning your meals into sandwiches! Meatball subs, chicken or eggplant parmesan, or really anything delicious with marinara are excellent options for sandwiches. Plus, these are finger foods, which are great for your young one who’s working on their fine motor skills. It might get messy, but at least your kids are eating and loving their meal. Shredded chicken, pulled pork, or ground beef can all work for making some sumptuous sliders for your little ones. Sliders are amazing because they’re easy for your child to pick up and eat; they’re the perfect size. With ground beef, turn the beef into a mini hamburger patty, and feel free to try out a variety of sauces. Your preschooler or toddler might love their ketchup, but they also might enjoy buffalo or BBQ sauce. At the very least, American sliders can be customized to each person — meaning adults and kids alike will have a meal they love. Pot roast (or baked chicken) and chili are both such American dinner staples. They’re timeless recipes, they’re classics, and while the cooking time is lengthier, the “set it and forget it” type of preparation can be appreciated by all. Making this earlier in the day on a Sunday, and by dinnertime, you’ll have a scrumptious meal that will last for several days. As a preschool and daycare, we understand how busy our families are. We do everything in our power to help your family, and to help your child grow. From having four convenient preschool and daycare centers in Salt Lake City to implementing the exceptional Reggio Emilia philosophy in our teachings, to providing resources for your family to utilize, we are here for you. 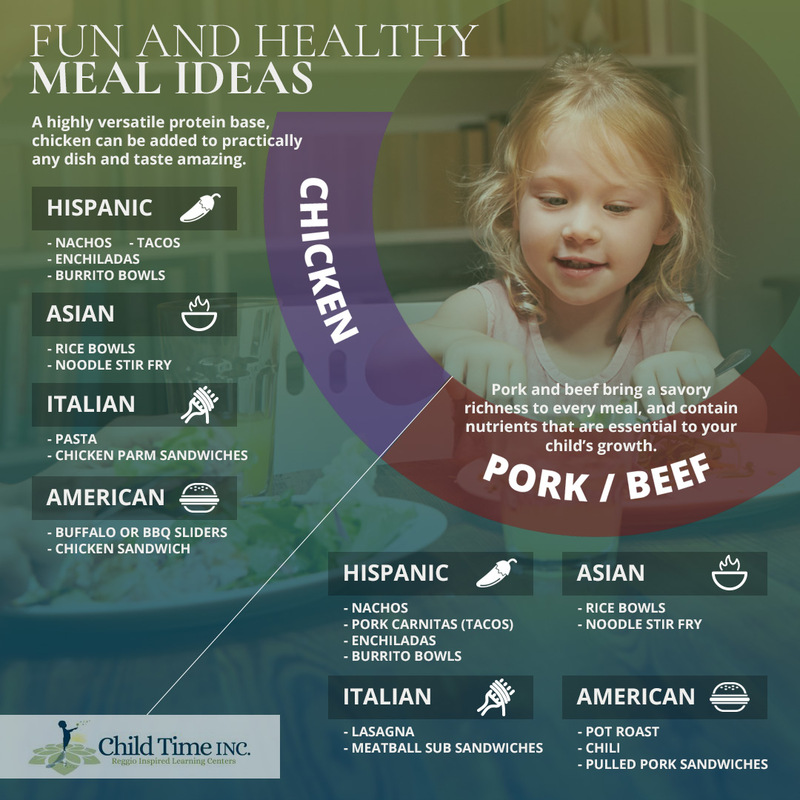 We hope these recipes make meal planning a little easier, and we hope you schedule a tour with Child Time Inc. today!